The Memorial Candle Program has been designed to help offset the costs associated with the hosting this Tribute Website in perpetuity. Through the lighting of a memorial candle, your thoughtful gesture will be recorded in the Book of Memories and the proceeds will go directly towards helping ensure that the family and friends of Jean Curley can continue to memorialize, re-visit, interact with each other and enhance this tribute for future generations. 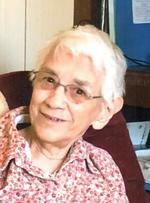 Jean E. Evans Curley, 97, of Summit Twp., passed away peacefully at her residence on Monday August 20, 2018. She was born in Morrisdale, PA on April 3, 1921 a daughter of the late H. Willard and Rachel Hugar Evans. Jean worked as a salesperson at Hoffman Camera Shop for over 17 years. She was an active member of All Saints Catholic Church and belonged to the Summit Senior Citizens. She enjoyed crafts, ceramics, volunteering and assisting with the Sunshine Group of Erie, and making her own clothes in her younger years. In addition to her parents she was preceded in death by her husband of 56 years, Thomas J. Curley; one grandson, Matthew Spano; two sisters, Vivian and Viola Evans; one brother, Robert Evans; and two sons in law, Samuel Spano and Ronald Moser. Survivors include two sons, W. Hugh Curley and his wife, Gina, of Berthoud, CO and Timothy Curley and his wife, Judy, of Summit; two daughters, Susan Moser of Indianapolis, IN and Emily Spano of Erie; one sister, Grace Merrow of Morrisdale, PA; and many grandchildren, great grandchildren, great great grandchildren, nieces, and nephews. Friends may call at the Russell C. Schmidt & Son Funeral Home Inc., 5000 Wattsburg Rd., on Thursday from 2 to 4 p.m. and 6 to 8 p.m. and are invited to a Funeral Mass at All Saints Catholic Church on Friday at 10:00 a.m.. Burial will be private and at the convenience of the family in Erie County Memorial Gardens. In lieu of flowers memorial contributions can be made to VNA Hospice of Erie County, 2253 W. Grandview Blvd., Erie, 16506. To send flowers to the family of Jean E. Curley (Evans), please visit our Heartfelt Sympathies Store.